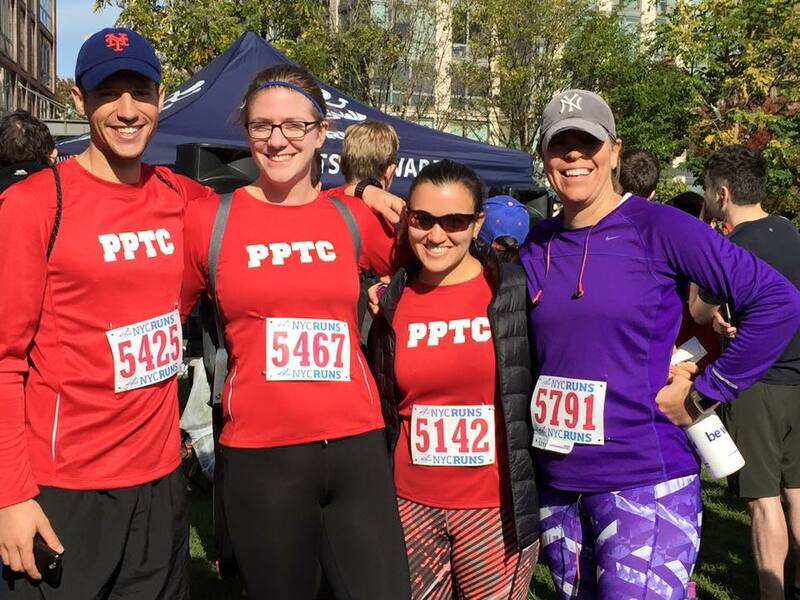 Since I had bonked in the last mile of the Staten Island 5K and had a ‘take it easy’ half marathon in San Francisco, I really wanted just one PR this fall. 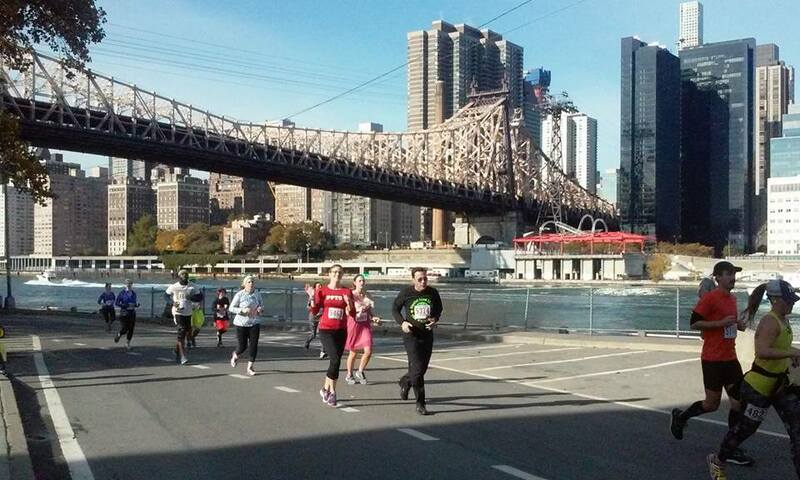 My last two 10Ks (UAE Health Kidney on 5/30 and Queens 10K on 6/21) were painful, humid slogs. This 10K featured slightly more crisp weather and the experience of more speed training and cross-training. I came up with A, B, and C goals in 2-minute increments (55-57, 57-59, and 59-1:01) based on mental math, and my C goal would have me PR. 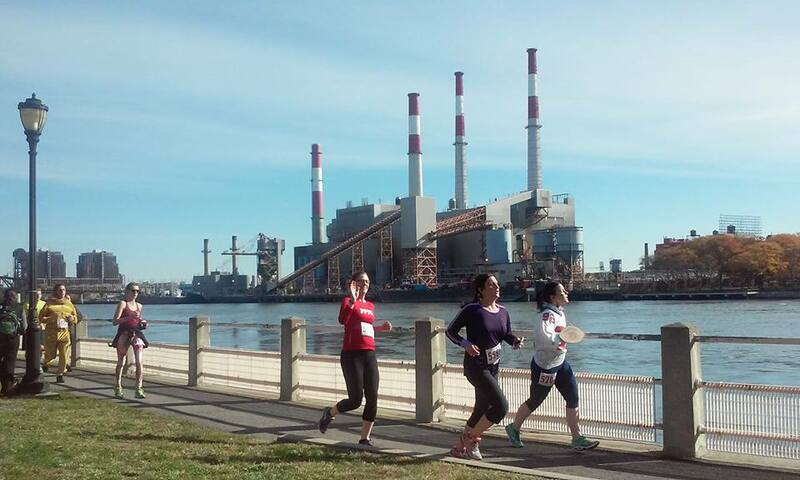 I had ran the 5K version of this race last year, a 10K last December, and another 5K on Roosevelt Island on Memorial Day (where I got my 5K PR of 26:16), but the course had changed just slightly based on construction. Roosevelt Island is very flat, which really helps in the PR department. NYC Runs doesn’t have corrals for this race, so there is some definite bottlenecking at the start of the course, but it gets a lot less crowded by mile 2. 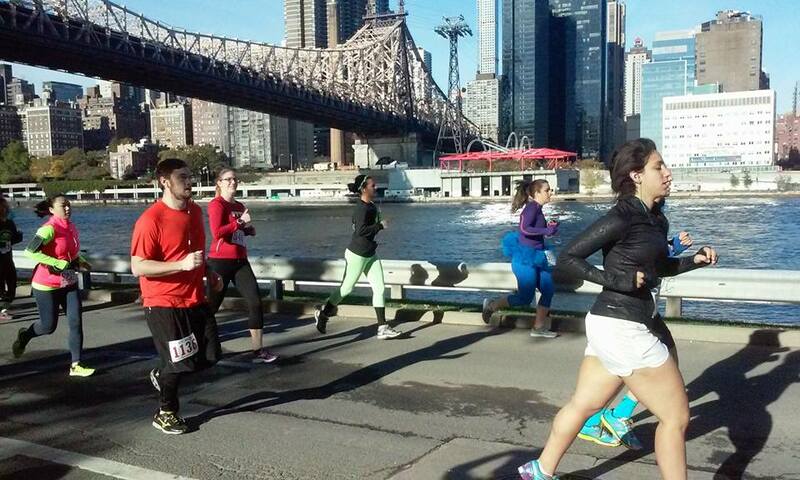 I knew to be aware of sidewalk dipping and some uneven footing, but overall I’m a big fan of races on Roosevelt Island and it feels like a pretty known entity. I took a 70-minute restorative yoga class on Friday night, so I felt pretty relaxed going into this race. The 9:30am start time really helped, too. I had my usual breakfast of 2 mini frozen waffles with cookie butter, some iced coffee, and plenty of water. I sometimes use almond butter if I’m feeling healthy, but speculoos works just as well. It also tastes great with bananas and I have Wafels & Dinges to thank for this combination. I entered the start corral toward the middle/back with some friends, one of whom (Gabby of Marathons & Macarons) wasn’t shooting for a PR but was still going to race it a lot faster than me. Our teammate Johnny was way in the front, where he rightly deserved to be (coming in 4th overall and 1st in the 20-29 age group). I wasn’t running with music because I wanted to be hyper vigilant of my breathing and my body. This being a race held on Halloween, there were some great costumes. But I was glad not to be wearing one. 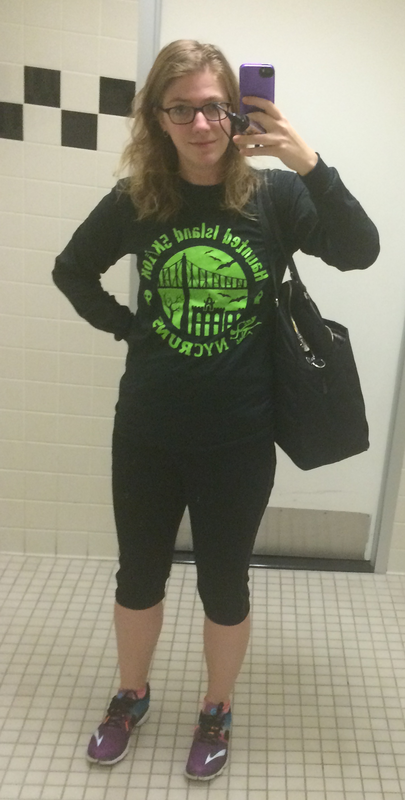 I wore my long-sleeved team shirt and planned to roll up the sleeves as needed. I definitely could not have handled the extra bulk of a tutu or the head warmth of a character hat. A teammate who ran the 5K kindly took photos of us 10K runners. I didn’t see her the first time, but then I caught on to where she would be. I was stuck behind several couples on miles 1 and 2, but decided to keep drafting them until the path got wider. Then came the Minions and the penguins. I noticed 3 separate groups of people dressed up as Minions and am delighted to say that I only finished behind 1 group of them who passed me around mile 4.5. The couple dressed in full-body penguin suits kept with me during their selfies, then sped up and stayed ahead. I saw some teammates after the 5K, which gave me a little juice for the fourth mile before I inevitable slowed during the fifth. My splits had been looking so good, but my overall average pace from this was 9:30 which means my Garmin (Forerunner 220) and I have some issues to work out. My Achilles felt ok and my breathing was fine, so I finally took it up a notch on the final mile. My Garmin was off by 0.2, so when my watch beeped for mile 6, I knew that I really had 0.4 miles to go. I managed to stay ahead of a pack of piñatas, much to my relief, then caught and passed the girl in front of me before attempting a sprint finish. My watch had somehow gotten so off time (I saw splits of 9:10-9:24 but nothing slower), that my final time of 59:04 felt a little slow. But it is a PR! And a negative split! I’ll take it! 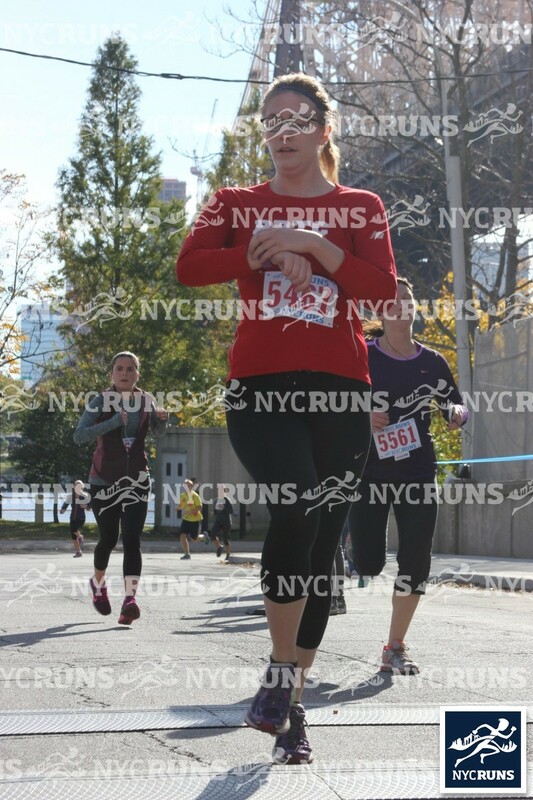 The finish line photos are not taken from a flattering angle. I got 48th out of 137 ladies in the 30-39 age group (and 307 out of 646 total finishers). Top half, all right! I grabbed a lot of candy for immediate and later consumption, then we got a very filling brunch. I rested my laurels the rest of the day and foam rolled so that I could make my Halloween debut as Angelina Ballerina later that night, then cheer on NYC marathoners all day Sunday. Post-race celebrations with candy in my backpack. We are not in costume. Look at that flatness! I know my first pace spike was in response to cheerers, but I have no idea why I picked it up so much at the 4 mile mark. I think that was when I was struggling with water and tried to take an unnecessary ShotBlok and dropped it. The shirt for this race was the same logo as last year’s tech t-shirt but was a cotton long-sleeved shirt and I love it. They ran out of (unisex) mediums so I grabbed a small. It’s very fitted but I can still wear it over a tank, as seen below before my rowing class. 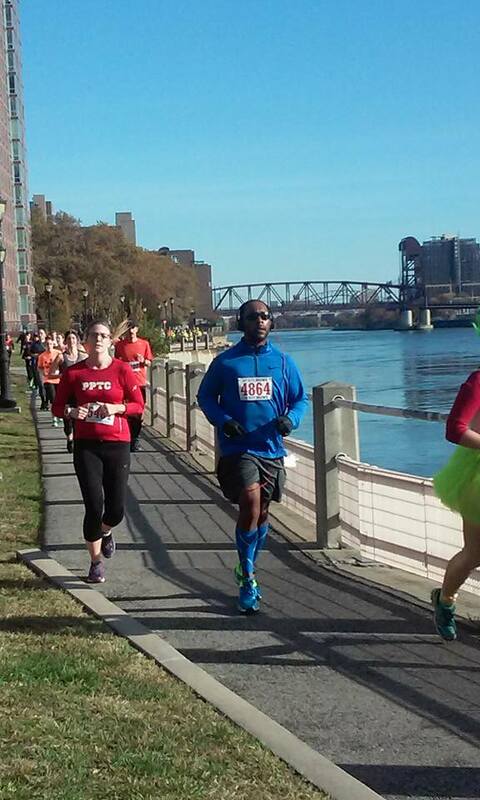 This was possibly my final race of 2015 because I need to heal my tendons, so it was nice to go out on a PR. I almost did that 10K but that morning I decided I needed sleep more. Hope your Achilles heal quickly. Hey L! How funny that wordpress found us. Wasn’t sure if/when to make my blog more public. It was a good 10K; I might volunteer at one of their upcoming races to get race credit for next year. Wait do you guys know each other IRL too? L, why haven’t you joined PPTC yet?! Yeah, we met at a Yelp event. H mentioned running and PPTC so we started talking to her. We will join! We haven’t been in BK on weekends for several weeks in a row so we were holding off. No excuses now. Congrats on the PR! And I love the second pic of you with the bridge. Sad to say, the faster pace on your Garmin likely isn’t an issue with the watch itself, it’s what happens when you don’t run the tangents, esp. in a crowded race (Have I mentioned I’m over 9+1?!). The only time I’ve ever gotten accurate race distance is during the Al Goldstein 5Ks when I’ve hugged the inside of the park loop the whole way. I really wish I were better at running by feel, because then I’d just memorize goal splits/use a pace band and only look at total time on my watch. 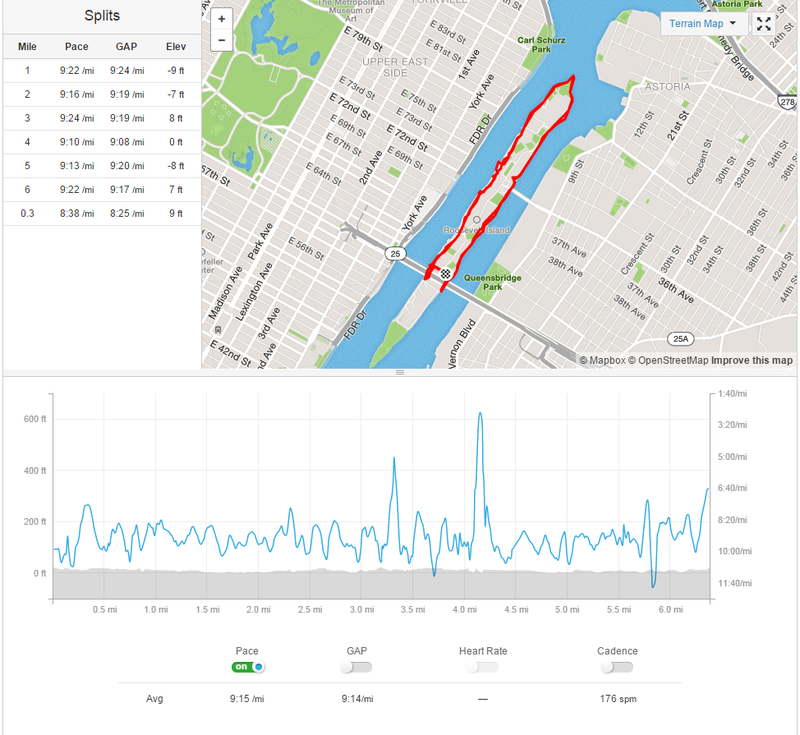 But as long as you’re gunning for a PR and using a Garmin on autolap, you’ll have to plan to run faster than goal pace per the Garmin splits (eg, if I’m gonna depend on the Garmin autolap for my half-marathon goal pace of 7:55, I’d probably have to plan to run 7:45-7:50 Garmin splits. GAH so fast.). Yeah I’ve just accepted that I’ll never run the tangents haha. Even when I’ve done speedwork on the track I run extra! Actually what I miss most about Coach Tony’s speed class is that I’d never wear a watch (since he yells splits), and somehow I alway stayed consistent/negative split.